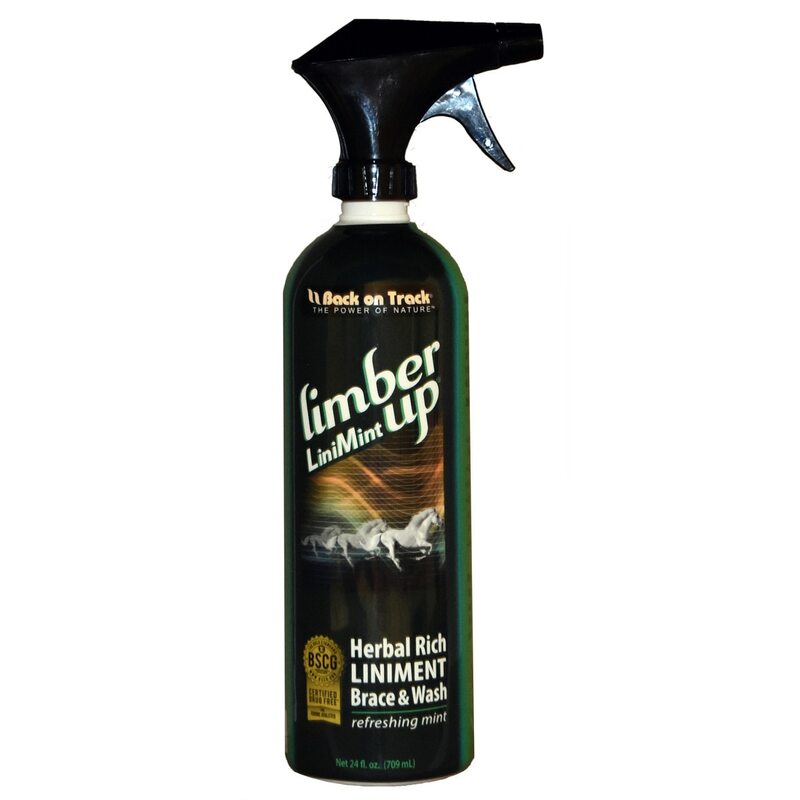 From Back on Track® USA comes Limber Up® LiniMint™ Leg & Body Brace Liniment, an all-natural cooling liniment created to help improve suppleness and range of motion. Soothes overall aches, joint stiffness, muscle, tendon and ligament soreness commonly associated with daily use and exercise. Back on Track®'s Limber Up® products are pesticide, sulfate & paraben free; with no synthetic or artificial ingredients. 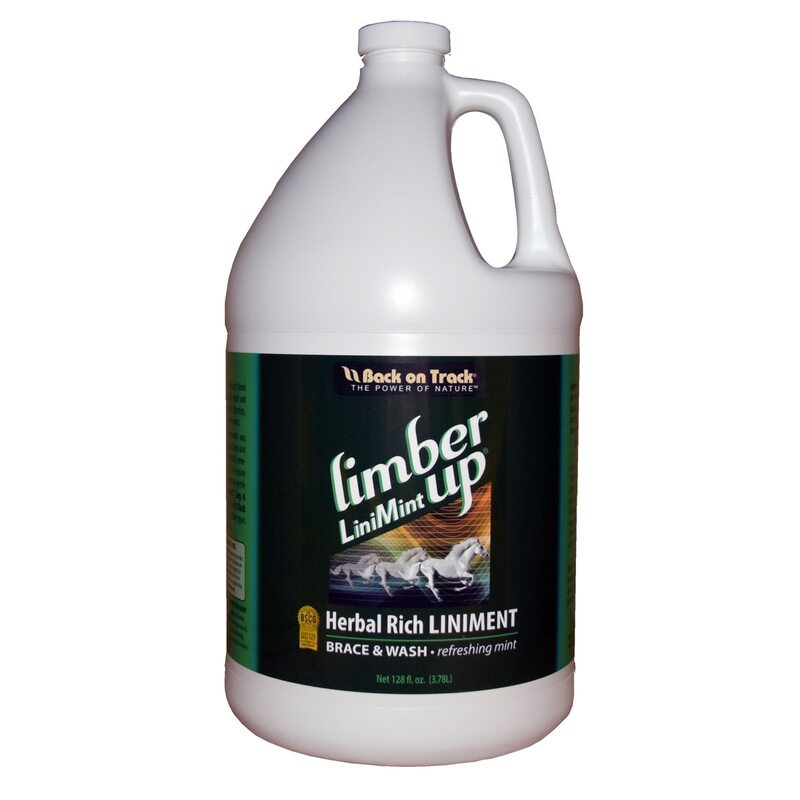 Limber Up® products are non-GMO, Vet approved, and made in USA. Available in an 8 oz. Spray Bottle, a 24 oz. Bottle with Trigger Sprayer and Gallon Refill. Can be used on animals with sensitive skin. Cools, soothes and relaxes sore muscles. Helps relieve soreness and swelling. Can be used alone or under wraps and blankets. Can be sprayed on as is or mixed with water and used as a bath brace. Use as a brace to help tighten before or after exercise. Can be appplied cold or hot. Made with Peppermint Essential Oil that is not only therapeutic but also adds a wonderful scent! Non-greasy formula won’t leave a residue. Shake well before using. As a Liniment, use full strength right from the bottle before or after exercise. As a Body Brace and Bath Wash, dilute ½ to 1 oz in a gallon of water. Creates a stimulating and refreshing brace and wash. Use to sooth and cool down the large muscle groups. Has shown great results with Back on Track® Welltex® products & other types of therapy equipment and protocols. Available in a 24 oz. Bottle with Trigger Sprayer and Gallon Refill.